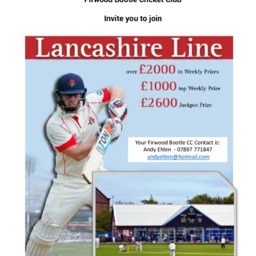 FBCC is promoting the Lancashire Line lottery run the Lancs CC foundation. Signing up now also gets you two tickets to a county game at Old Trafford. The value of the tickets basically is your money back for playing the lottery for the whole of the next year. Hurry and join, but don’t forget to put FBCC down as your nominated club.